A fabulously light refreshing lotion/gel, easily absorbed for above and below the eyes. 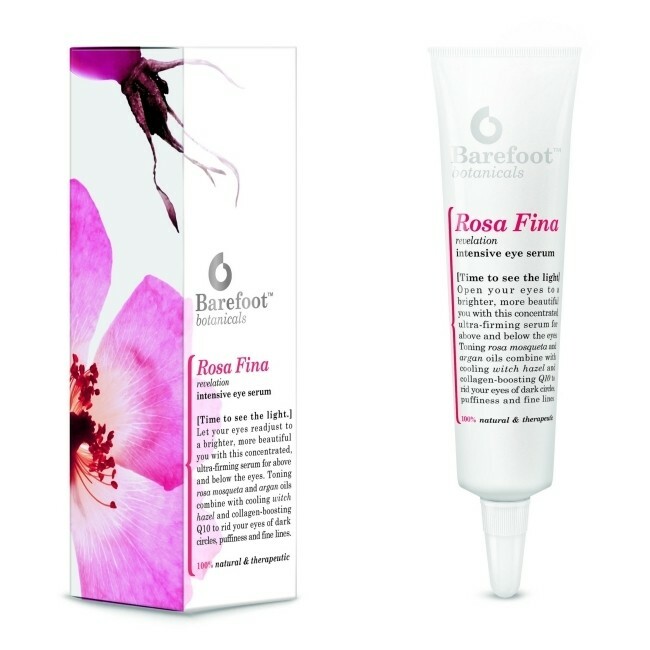 Barefoot Botanicals have harnessed the power of firming, line-smoothing natural ingredients in a light-but-effective serum specifically formulated to banish shadows, fine lines and all kinds of under-eye baggage. Its silky, lightweight texture ensures optimum penetration, without irritation. A fabulously light refreshing lotion/gel, easily absorbed for above and below the eyes. Regular use will help fade fine lines, wrinkles, ease puffiness and dark circles. Great for the morning-after-the-night before. For exernal use only. Avoid contact with eyes. Aqua,Rosa Mosqueta (Rosehip Seed Oil), Cetearyl Alcohol (vegetable wax), Cetearyl Glucoside (vegetable emulsifier), Glycerin (vegetable moisturiser), Argania Spinosa (Argan oil)), Borago Officinalis Seed Oil (Starflower), Macadamia Ternifolia , Panthenol (Vitamin B5), Tocopheryl Acetate (vitamin E), Lonicera Caprifolium (Honeysuckle), Alcohol (from Sugar Cane), Hamamelis Virginiana (Witch Hazel), Xanthan Gum (vegetable thickener), Helianthus Annuus (Sunflower oil), Lonicera Japonica (Japanese Honeysuckle) , Santalum Album (Australian Sandalwood), Acmella Oleracea (Paraguay Cress), Allantoin (Comfrey extract), Alpha-lipoic Acid (Antioxidant/coconut), Retinyl Palmitate (vitamin A) , Rosa Damascena (Damask Rose) , Limonene*, Boswellia Carterii (Frankincense), Ubiquinone (Co-enzyme Q10), Lavandula Angustifolia (Lavender), Glyceryl Caprylate (Palm/Coconut emollient), Tocopherol (vitmain E), Arnica Montana, Ascorbyl Palmitate (vitamin C), Bellis Perennis (Daisy), Citrus Nobilis (Mandarin), Alchemilla Vulgaris (Ladys Mantle), Calendula Officinalis, Equisetum Arvense (Horsetail), Tussilago Farfara (Coltsfoot), Geraniol*, Citronellol*, Farnesol*, Citral*, Linalool*. *Aromatic components of organic essential oils.